Server Core, Target, and Initiator: Commanding them to work! In the months since I have spoken with a lot of people who have asked me if this would work with Microsoft Hyper-V Server, and if so… how? The answer, of course, is YES it will work, but as with all things command-line, you cannot simply rely on the GUI and as such, there is another layer of complexity involved. By following these steps you will be able to configure your Hyper-V Servers (as well as your Windows Server Core boxes) as nodes in a failover cluster. In the Hyper-V Server Configuration menu there is an option (number 11) to enable the Failover Clustering Feature. This takes a few seconds, and you are off to the races. You will also have to use Option 4 to Configure Remote Management; although I am sure it is all configurable by command line, I would much rather create my Failover Cluster using the Failover Cluster Manager. You can do this either from a server with the Failover Clustering feature enabled, or from a system with the Remote Server Administration Tools (RSAT) installed. That server does NOT need to be a node of the cluster. We see here that I have a single target available to me, with the IQN (Internet Qualified Name) of iqn.1991-05.com.microsoft:swmi-storage-target1-target – which shows that my SAN provider is Microsoft, that my server is called swmi-storage, and that my target (LUN) is called Target1 (I have a great imagination for names). This logs my server in to the target that was listed. This will make sure that the login is persistent – whenever you reboot. Admittedly, much of the information found therein will not be helpful. However it will determine that your target is persistent. In this screenshot you can see the session ID, Target Name, Initiator, Initiator SCSI device, Initiator bus, target ID, and target LUNs – in this case, there are four LUNs. Now that you have presented your target (or targets) to the servers you are ready to continue remotely with the GUI… the easy part, which you can review in the blogs posted up top. Remember, managing your servers via command line may be daunting, but it pays off. Not only does it usually give us better control over what we are doing, but by using Server Core (or Hyper-V Server) you can take back a lot of resources that would otherwise be wasted on the GUI. Have fun and have a great week-end! ← Office365 Outage: It happens… know about it. Luckily, in Server Core installations of Windows Server 2008 R2 and Hyper-V Server 2008 R2, the bottleneck surrounding iscsicli.exe has been identified and solved. 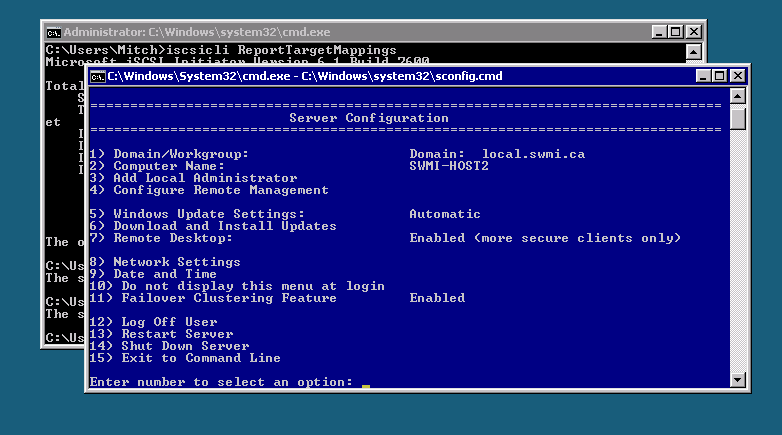 While you can still script the management of iSCSI targets through iscsicli.exe, you can also use iscsicpl.exe, which provides a graphical interface, identical to the one in Full Installations of Windows Server 2008 R2.